Comparison between the French version and the uncut international Version (both contained on the French DVD by Metropolitan). Though there are, at least in two parts, overlaps with the German version, the French version is cut differently. The conversation of Sammo Hung and one of the prostitutes at the beginning was also removed here, although this scene shows his character and his intentions quite well (which is even more visible in the HK version, as mentioned in the other cut report). Consequently, they also cut out some later scenes in which the romantic part, his relationship to Olivia Cheng's character, is thematized and so this plot line was a little bit reduced. Eric Tsang, as chief of the security, is also not that present - the scene with the horse was completely cut out, while in the German version only the discussion at the end was missing (the following magnet part was also missing there, but the French version contains this part). A few further comedy moments were also removed. The here used French DVD contains both versions, but the uncut international version is only available via the language selection in the menu. Consequently, it has the original sound track with French subtitles and it can't be changed! The disc structure is a little bit strange and it doesn't work as smoothly as the other seamless branching releases - shortly before the first alteration, the movie stops for a moment because at the end of the chapter it automatically jumps to another part of the disc which contains the movie with the few, in the first third occurring, individual cuts. Then there's another short stop and the, in both versions identical, next part of the movie starts etc. After the meeting of Yun Shiyu's (James Tien) group of gangsters, Fong-Tin Ching (Sammo Hung) and Siu-Hon (Olivia Cheng) are shown in the garden. He tells of a village 350 miles westwards where life would be better. (These first seconds are also missing in the HK version.) He wants the girls to follow him there. Siu-Hon kisses him and they fall down on the floor, but Fong-Tin stays rather cold towards her. A watching man is already justification enough for him to end this whole thing. Siu-Hon then says that she doesn't want to be in his debt forever and that he saved her and her colleagues after all. Fong-Tin jokes a little bit and then makes clear to her that they don't owe him anything and that he's only interested in their well-being. After Tsao Cheuk Kin (Yuen Biao) spoke to his men, there's missing a longer scene with Fong-Tin again. He enters a room and thinks about his past. He's shown as a child playing with fire, his mother warns him. Then, Siu-Hon enters and talks to him briefly and shows her affection for him while Fong-Tin keeps her at arm's length. Chi (Rosamund Kwan) heeds the advice of Fong-Tin and tries to distract Tsao. So she follows Tsao and extensively tells him something about a romantic dream. He listens, but then cuts her off coldly and leaves. Chi runs after him whereupon he kisses her wildly and says that he'll watch her closer from now on. She wants another kiss, which he didn't expect - so because she closes her eyes, he quickly sends to of his men to fulfill her wish. The scene with the "horse" and its "rider" Jook Bo (Eric Tsang) is completely missing in the French version. The security chief sits on the shoulders of one of his men and spurs him like a horse, apparently as a kind of test, just in case. They run after another man with a carriage and try to jump on it but they just fall down. The security chief moans but the other one lists all the terrible things that would have happened with a real horse. At last, he spits on Jook's arm and after some grimacing he runs after him in a sped up shot. After Fong-Tin was thrown into jail, the also imprisoned gang of Jook Bo is shown. Loi Fook passes the bars and Jook convinces him to hand over the gun because he, as former security chief who was always only equipped with a knife, is interested in it. Of course, he immediately tries to get into the cell, but he can't get it through the bars. Loi takes the gun again and Jook puts the blame on one of his fellow prisoners (Yuen Wah). In the end, they both sit there crying for their mothers. Loi goes out to Tsao and says that there should be more guards for all those cunning thieves. But the staff is small and Loi finally mentions that he wants to search for some more evidences against Fong-Tin. 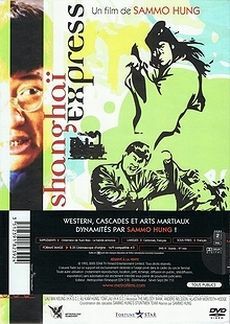 Fong-Tin's pensive moment was shortened a little bit, the French version continues in the middle of a shot and shortly before the end. At the beginning he can be heard coming to the conclusion that he can't keep Siu-Hon waiting forever. Moreover, he says that he can't wish for more than a dedicated wife. Fong-Tin's solution for the water problem is missing. He gets up and urinates on Loi Fook's gun. He looks astonished and shortly after, the gun is working again, if only briefly. So he asks for water again and with the answer to that, the French version sets in again.